Newtonian mechanics has established the limits of speeds, starting from the rest to an infinite speed. The Special Theory of Relativity (SR) has set these limits as being zero and speed of light c. The Special Symmetrical Relativity (SSR) postulates the existence of V as being the unattainable minimum limit of speed and accepts c as the unattainable upper limit of speed for particles. The limit V obeys the same invariance of c with respect to the kinematic aspect. It has a value of 4.53 × 10−14m/s. It can be obtained theoretically by many ways, by including relations involving only the fundamental constants. So the minimum speed V belongs to the select group of the fundamental constants of nature. Much more clarifications could be provided for the origin of V, which is necessary for a deeper understanding of SSR. We can not ignore the fact that V represents a hypothetical gravitational speed of the electron in the first (fundamental) orbit of the Bohr‘s Hydrogen atom (this important detail is being firstly announced here and it will be rigorously demonstrated in a forthcoming publication). The hypothetical gravitational speed in the fundamental orbit of the Hydrogen atom should be understood as being the velocity calculated only due to the interaction between the masses of the proton and electron without considering the interaction force between its charges, which is 40 orders of magnitude higher than the gravitational force. Now we introduce a background temperature in the spacetime of SSR so that we build a Deformed Special Symmetrical Relativity (DSSR) by connecting the dynamics of the particles in SSR to the temperature of the Cosmic Background Radiation (CBR). So we are able to obtain a function c(T) with which we can trace a true panorama of the evolution of the Universe starting from the Big Bang until its total extinction. Thus, we are able to investigate such dependence of c and also of V (since they are closely related) with respect to the CBR temperature. The universe cooled from the highest temperature 1032K (the Planck temperature TP that corresponds to c) that generated the inflationary period until reaching the final temperature of a too-rapid accelerated final expansion. The evolution of the expanding universe until the present time when we have a soft accelerated expansion associated with a tiny positive value of the cosmological constant connected to a CBR of 2.73K will continue until approaching its final minimum temperature Tmin of about 3.28 × 10−12K – Tmin corresponds to the minimum vibration V – when a very rapid accelerated expansion (the final inflationary period) will govern again at the end of the universe, thus leading to a Big Rip of the spacetime tissue. This DSSR theory leads to the so-called Cosmology of Completeness. horizon problem (background isotropy). Basically, the horizon problem refers to the remarkable homogeneity of the Universe, which was guaranteed because of its extremely rapid expansion (inflationary period) with a speed that was much higher than c. This led to a universe whose radius increased by 50 orders of magnitude in a surprisingly small interval of time. 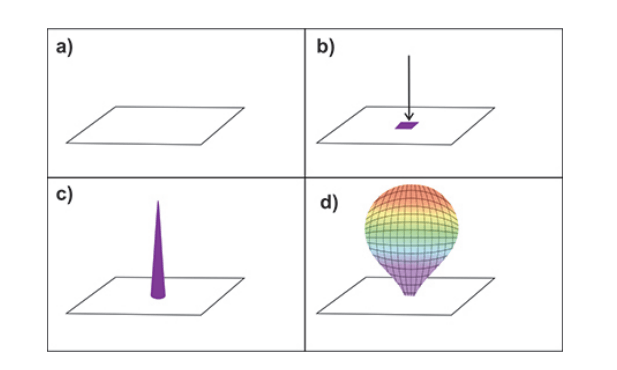 Joo Magueijo et al proposed the theory so-called Variation of the Speed of Light (VSL) as a supposed solution for the horizon problem. 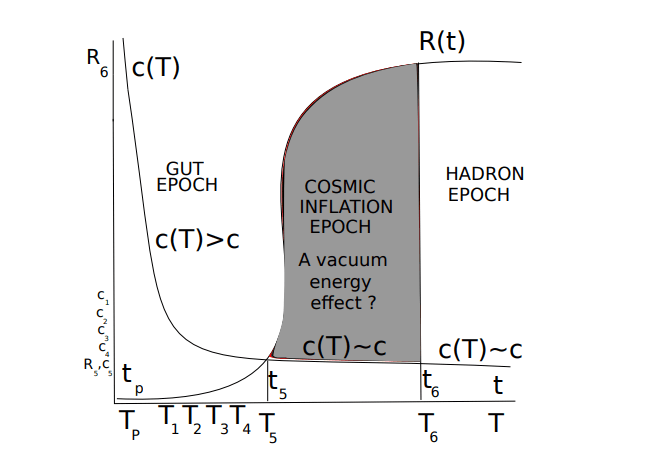 They tried to overthrow the inflationary model in the following way: “If there was a speed of light much higher than its current value c exactly during the interval of time when the inflation occurred and also after this period, the puzzle of homogeneity would be easily solved, since the higher speed of light could connect the distant points of the space in order to justify the quasi-isotropic CBR”. However, by means of the theory so-called True Variation of the Speed of Light (TVSL) given by DSSR theory, it was rigorously demonstrated that the current value of the speed light (c) had already been reached and practically became stabilized just before the inflation period (Fig.1). Therefore, the claim to replace the inflationary period with a VSL should be decidedly forgotten. Dark energy, which is expressed by means of the cosmological constant, plays an extremely important role in SSR theory. Anti-gravity and gravity fight each other throughout the existence of the Universe. Hadronic matter and dark matter are responsible for a gravitational attraction while the dark energy produces anti-gravity. 1 − T/TP. At the beginning of the universe when it was a singularity with a minimum radius of the order of the Planck radius, i.e., RP ∼ 10−35m, having the Planck energy scale Ep ∼ 1019GeV which corresponds to the Planck temperature TP ∼ 1032K and the Planck time tP ∼ 10−43s, the speed of light c′ was infinite since there was no spacetime. But immediately after, when T1 = 1031K, the speed of light had already assumed a value close to the current value as shown by c(T), and therefore a cone of light (a spacetime) had been formed; i.e., with c = 2.99792458 × 108m/s for the present time, then, according to the function c(T), we find c1 = c(T1) = 3.16008998 × 108 m/s (see the figure). Subsequently, for T2 = 1030K, we find c2 = c(T2) = 3.01302757 × 108 m/s. For T3 = 1029K ⇒ c3 = c(T3) = 2.99942467 × 108m/s. And for T4 = 1028K ⇒ c4 = c(T4) = 2.99807447 × 108m/s. Finally, for T5 = 1027K ⇒ c5 = c(T5) = 2.99793955 × 108m/s. From this temperature T5 = 1027K, when t = t5 ∼ 10−35s, corresponding to the energy scale of the Grand Unified Theory (GUT) with 1014GeV, the universe inflated very quickly, starting with a radius R5 ∼ 10−25m and reaching R6 ∼ 1025m at the time t6 ∼ 10−32s; i.e., the size of the universe increased rapidly at 50 orders of magnitude. Since the speed of light c5 ≈ c, VSL should be put in doubt. Hence, perhaps the vacuum energy had played a fundamental role in that epoch. Image courtesy Cláudio Nassif Cruz & Fernando Antônio da Silva. At the end of the Universe, which is predicted to be around 20 billion years from the present time, the universe will suffer its ultimate inflation. It will be the final cataclysm. 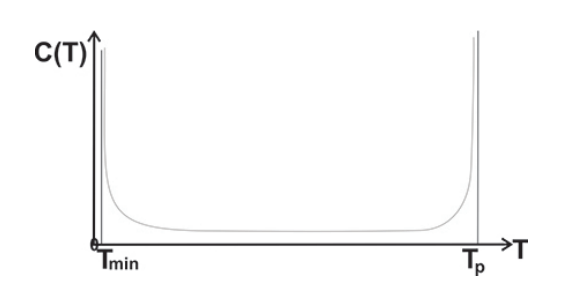 As one approaches Tmin, the speed of light will again increase vertiginously towards infinity (Fig.2), and therefore the energy of the vacuum will also diverge. Everything will happen in as little time as the Big Bang times. The fabric of spacetime will rip (Big Rip). It will be practically an infinite temperature that will be reinstalled again. 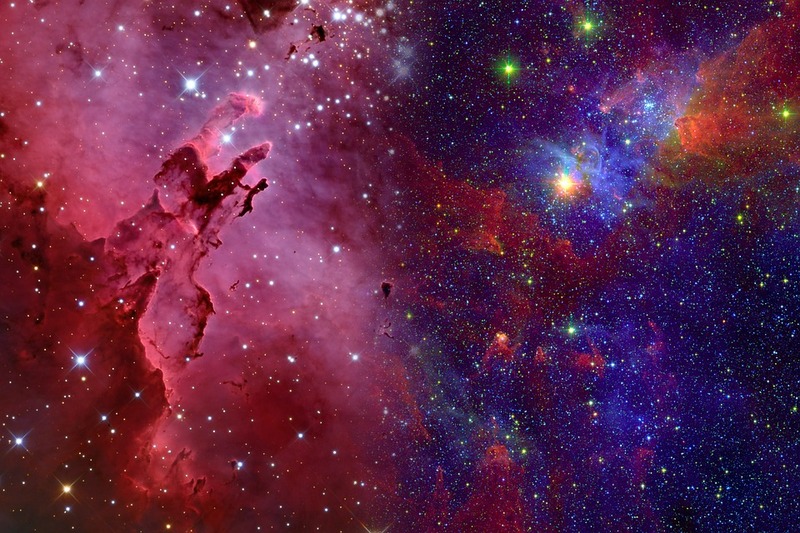 Other universes (babies universes) will fatally re-emerge from the rags of smoking tissue reminiscent of the space-time of our old and then extinct Universe. hot babies universes will arise and so on. During the expansion of the Universe, it passed by a very special moment, i.e., an intermediary time when it was verified that the attractive gravitational potential (gravity) and the repulsive gravitational potential (antigravity) are equal, i.e., a region of phase transition (Fig.3) between gravity and anti-gravity. In this regime, the spacetime has assumed a Euclidean geometry, i.e., a flat space (null curvature). The expanding Universe arose from an initial singularity condition when anti-gravity dominated in order to provide the initial inflation. According to the observations of 1998 (Perlmutter et al), the expansion of the current universe is accelerated. Thus, at the present time, the curvature of spacetime is slightly negative, but still very close to the flat geometry. Universe with matter and anti-matter. FIG. 2: This graph shows that the speed of light c(T) diverges for both limits of temperature, namely Planck temperature TP (∼ 1032K) for the scale of Planck LP (∼ 10−35m) in the early (too hot) universe, and a minimum temperature Tmin(∼ 10−12K) in an ultra-cold universe connected to a horizon radius rh >> ru(∼ 1026m), i.e., we have obtained the following generalization for c(T) within DSSR scenario, namely c(T) = c/√1 − Tmin/T√1 − T/TP. Image courtesy Cláudio Nassif Cruz & Fernando Antônio da Silva. FIG. 3: This graph shows the potentials of SSR representing the function that presents two regimes, namely: a) The attractive (classical) regime is well-known as Lorentz sector for describing the gravity of a source of matter like a sphere of mass having a proof particle with mass m0 on its surface. This particle escapes from this gravity with an escape velocity v0 ≤ vesc < c according to the attractive (positive) potential 0 ≤ ϕatt < ∞. b) The repulsive (quantum) regime is the sector that provides the signature of SSR for describing anti-gravity of a source of dark energy (vacuum energy) like an exotic sphere of dark mass having a proof particle of matter with mass m0 on its surface. In this quantum sector, the escape velocity from anti-gravity should be understood as the input velocity V < vin ≤ v0 according to the negative (quantum) potential −c2 < ϕQ ≤ 0, such that the proof particle with mass m0 is able to penetrate the dark sphere whose anti-gravity pushes it far away. 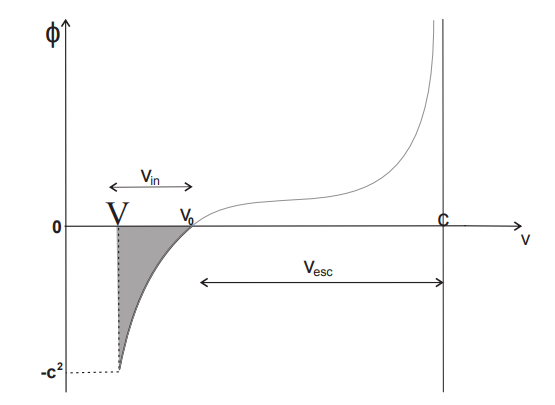 Here we should observe that there is an intermediary velocity v0 =√cV, which corresponds to the point of phase transition between these two regimes in such a way that the general potential ϕ = 0. This means that v0 can represent both escape and input velocities, which depends on the sector we are considering. In the quantum sector (anti-gravity) of SSR, we have vin = v0 for ϕ = ϕQ = 0 and vin = V for ϕ = ϕQ = −c2, since we just take into account the sector of negative potential. Image courtesy Cláudio Nassif Cruz & Fernando Antônio da Silva. Even in the fundamental state of the quantum vacuum, it undergoes small fluctuations because of the zero-point energy, when there is still the creation of virtual particle pairs. However, a completely flat time space like the surface of a serene lake without any fluctuation and from which no pairs of particles emerge can be effectively idealized: THE NEWTONIAN FLAT SPACE (Fig.4). We are bringing back old issues that the dialectical materialists were careful to have buried. FIG. 4: A Newtonian or flat space works like an uncreated primordial universe. For an unknown reason, this “serene lake” (null curvature-(a)) is in the eminence of being disturbed (b). An infinite negative curvature arises generating a vacuum with a very strong anti-gravity which creates a high peak at the Planck scale (c). The temperature that increases drastically leads to the emergence of an inflationary bubble (d) that will generate our universe. Image courtesy Cláudio Nassif Cruz & Fernando Antônio da Silva. These findings are described in the article entitled Variation of the speed of light and a minimum speed in the scenario of an inflationary universe with accelerated expansion, recently published in the journal Physics of the Dark Universe (Physics of the Dark Universe 22 (2018) 127-136). This work was conducted by Cláudio Nassif Cruz and Fernando Antônio da Silva from the CPFT: Centro de Pesquisas em Física Teórica, Rua Rio de Janeiro. Cláudio Nassif Cruz is a PhD at the CPFT: Centro de Pesquisas em Física Teórica, Rua Rio de Janeiro. Fernando Antônio da Silva is a researcher associated with the CPFT: Centro de Pesquisas em Física Teórica, Rua Rio de Janeiro.